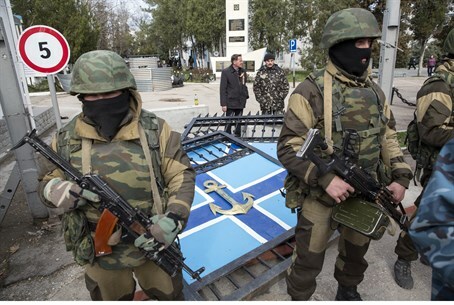 Military takeover sparks media furor, just 24 hours after Russia annexes the peninsula. Are more takeovers to follow? Russian forces stormed one of the last remaining Ukrainian air bases in Crimea on Saturday, taking it over after at tense standoff, according to video footage. As of late Saturday night, one Ukrainian soldier has been killed as a result of the takeover. The live stream was taken down shortly after a Russian convoy broke through the gates at the Belbek base - but it sparked a furor in international media, where it was cited as a prime example of the Russian military's aggressive takeover of the area. The Ukrainian base commander, Colonel Yuliy Mamchur, told Reuters that one serviceman had been injured and that he was being detained by the Russian forces. The Belbek air base takeover is only one day after Russia formally annexed Crimea, following a dramatic and controversial referendum vote. It also comes after a string of takeovers of Ukrainian military bases by pro-Russian militias, allegedly backed by the Russian military. Russia's takeover of Crimea has been met with criticism - as well as sanctions from Washington and Europe. On Thursday, U.S. President Barack Obama slapped sanctions on top Russian officials, and Putin retaliated by hitting top U.S. officials with sanctions of his own. International attention has focused on the ongoing crisis between Russia and Ukraine, which has snowballed since spiraling into crisis in December. Concern is rising that the Crimean takeover could turn into a precedent for Ukraine to splinter further - especially over protests erupting in the pro-Russian province Donetsk. The Crimean peninsula has become the focus of the conflict, which exploded earlier this month after 6,000 Russian troops invaded an airport in the Russian-speaking Ukrainian province.